Cape Ann Whale Watch in Gloucester, Massachusetts provides guaranteed whale sightings for every whale watching tour out to Stellwagen Bank, a national marine preserve about 12 miles off the coast of Gloucester deemed one of the "Top 5 Whale Watching Destinations in the World" by the World Wildlife Fund due to the wide variety of whale species whom migrate to the coast of Gloucester, Massachusetts every year to feed on the abundant natural resources. We provide the best whale watching in New England as it's an awe-inspiring experience which every human being should have the opportunity to appreciate. We make it a very special event. Now Celebrating Our 41st Year! Cape Ann Whale Watch has been dazzling whale watching enthusiasts with sightseeing tours aboard the largest, fastest and most elegant whale watching vessel in Massachusetts, north of Boston, Massachusetts aptly named "The Hurricane II" due to its immense size and speed as it descends upon its destination. Cape Ann Whale Watch's patrons have the opportunity to spend a lot more time with the whales than with other whale watching companies in Gloucester MA since "The Hurricane II" gets to the whales' feeding grounds with much more expediency as well as traveling home faster, therefore more time is actually spent observing whales including but not limited to Humpback Whales, Minke Whales, Northern Right Whales, Pilot Whales, Sperm Whales, Sei Whales, Blue Whales (The Largest Whales in the Seven Seas yet seldom seen around Gloucester MA), Fin Whales, Atlantic White Sided Dolphins, Harbor Porpoises and whole host of other fascinating marine creatures as we deliver the best whale watching excursion in Massachusetts. "The Hurricane II" boasts 115 ft length with over 400 ft of whale watching room from the railings of the upper and lower observation decks for optimum whale watching conditions. There is a heated, furnished indoor cabin with a full service galley serving hot meals, snacks and cold beverages as well as a fully stocked bar with local brews, popular beer, wine and mixed drinks. 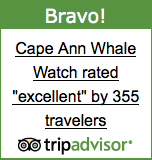 Cape Ann Whale Watch is truly the finest whale watching tour in the Boston MA area offering the highest level of quality, comfort and service at the cheapest, most affordable price suitable for any family entertainment budget whether on vacation or a day trip. We offer AAA discounts on the adult tickets. We also offer reduced rates for seniors, children and military families. We go where the whales go. Our vessels communicate with each other as to the location of whales so we will go anywhere to see them on the North Shore or South Shore of Massachusetts including off the coast of Boston, Massachusetts: Salem MA, Newburyport, Cape Cod, Hampton NH, Rowley, Rockport MA, Danvers, Peabody, Swampscott, Revere, Winthrop or wherever else the whales may roam. Subscribe To Our Whale Watch Newsletter! Guaranteed Free and Easy Parking! Just steps from the boat: No parking meters. Closest Whale Watch to Route 128N! Easiest to find, located just 1/2 mile off Rt. 128N. Bring Your Own Picnic Lunch! Or you can enjoy hot or cold food and beverage from our galley. Great For Children! They are our future, let our educators fascinate and thrill them with our on-board teaching tools. THE LARGEST, FASTEST & MOST POPULAR WHALE WATCHING VESSEL NORTH OF BOSTON MA! We feature the largest and fastest whale watch vessel North of Boston, in Massachusetts. 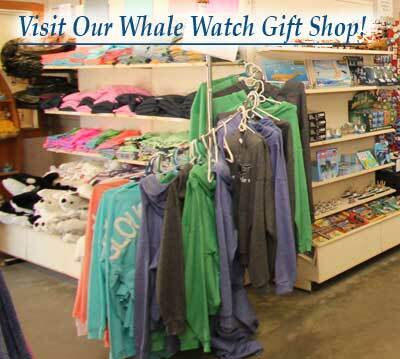 We are the pioneers of whale watching in Gloucester, MA and North of Boston since 1979. We are celebrating our 40th anniversary of watching whales. - Our commitment to whales and education is second to none!